Said Mostafavi, M.D., Los Angeles | Advanced Sleep Medicine Services, Inc.
Dr. Mostafavi has been a leader in the forefront of the field of sleep medicine for over two decades. He holds multiple board certifications including sleep medicine by two different certifying bodies, American Board of Sleep Medicine (ABSM) and American Board of Internal Medicine(ABIM), and a subspecialty in sleep medicine. Dr. Mostafavi is also boarded in internal medicine with ABIM subspecialty in pulmonary diseases and is trained in critical care medicine. He did his pulmonary and critical care training at UCLA combined program and was formally trained in sleep medicine at Cedars Sinai Medical Center under the mentorship of Dr. Philip Westbrook. 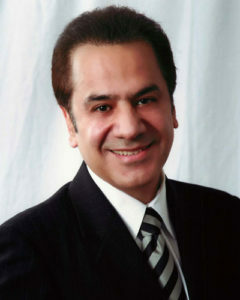 Dr. Mostafavi served as chief of pulmonary division and founder and medical director of sleep disorder center at Century City Hospital in Los Angeles. He is a fellow of the American Academy of Sleep Medicine and fellow of The American College of Chest Physicians. Dr. Mostafavi maintains a private practice in Los Angeles and serves on the clinical faculty at the UCLA School of Medicine and at Cedars-Sinai Medical Center. Dr Mostafavi has published articles in peer-reviewed journals including Chest and Respiration, and has been a frequent lecturer on the monitoring, diagnosis and treatment of sleep disorders. He has also appeared as a sleep expert on multiple radio and television outlets including, NBC, CNN, Channel 9 news, KNX 1070 and the television programs The Biggest Loser and Extra. Realizing the scarcity of sleep evaluation and treatment facilities in Southern California, Dr. Mostafavi founded and established ASMS in 1994. In 2010, ASMS was acquired by private equity firm, High Road Capital Partners, which facilitated regional acquisitions and new growth to make ASMS the leading independent provider of sleep medicine testing services and sleep-related durable medical equipment in Southern California. Dr. Mostafavi now serves as the Chief Medical Officer for Advanced Sleep Medicine Services, Inc.